This animal is a fossa. At first it closely resembles a cat. But when you look a little closer, close enough to look at its DNA . . . it's still pretty confusing. 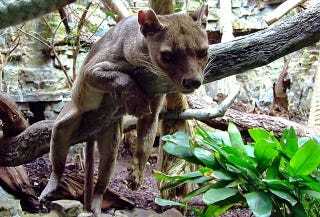 The fossa is the top carnivore in Madagascar. It is six feet long from nose to tail, sixty pounds, and moves with a lean agility, reinforced by retractable claws. First formally described by western scientists in 1833, it kicked off nearly two hundred years of debate about exactly what it is. Perhaps that's not the right way to put things. We know what it is. It's a fossa, pronounced "foosa," and it pads around Madagascar's forests eating lemurs. Scientists are more interested in debating what it is like. This has been a question posed about most Malagasy animals, since the island was in ecological isolation since it split off from Africa some time before monkeys were invented. When a fossa was first formally described in 1833 its protruding muzzle and rounded, slightly-tweaked ears caused scientists to throw it in with the family Viverridae. The family comprises many cat-like Asian and African mammals, the most well-known of which is the civet. Later, researchers took a look at its retractable claws and rethought their position, putting it in with the actual cats of the family Felidae. Then its lean build had scientists reclassify the fossa, grouping it with the mongoose and its family, Herpestidae. The civet, the cat, and the mongoose factions battled it out for about a hundred years, each claiming this one weird animal. Then DNA came along and clarified everything. In 1993, a study of the genes of the fossa put it in with Viverridae and the civet won out. In 1995, the authors of the same study took another look and put it in with Felidae. By the time the new millennium came around the fossa was back among the mongooses, with Herpestidae. The fossa now has its own family, Eupleridae, which lumps it in with other Malagasy carnivores, and keeps its separate from the animals in mainland Africa and Asia. Perhaps that's the best place for this adorable freak of nature.